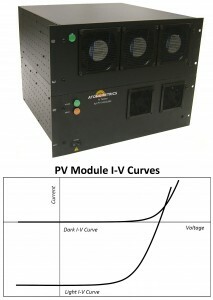 The Atonometrics Multi-Channel I-V Measurement System measures the current-voltage relationships (I-V curves) of photovoltaic (PV) modules. The system can both source and sink current, providing multi-quadrant measurement capability. This enables measurement of PV module I-V curves under either illuminated (light I-V) or non-illuminated (dark I-V) conditions. The master chassis provides for measurement of a single PV Module, and the optional expansion chassis allows for the simultaneous testing of up to six PV modules. Configurations available for a wide range of PV module currents and voltages. The Atonometrics PV Module I-V System can also be mounted in a in a ruggedized, portable carrying case. This configuration of the I-V system provides all the benefits of our standard rack-mount I-V system, but allows users to make PV module characterization measurements in the field. The Atonometrics I-V Measurement System for PV Modules is a versatile tool designed to meet your specific PV testing goals. Contact us for more information on this or our other products.